Your home is the most valuable asset you own. This means you will probably do whatever you can to protect it and to keep it safe at all times. As part of this, it helps to know what the biggest threats are to your home. While some might guess that fire might be the leading cause of problems, the leading causes of damage to most American homes are actually wind damage & water damage. According to The Leavitt Group, wind damage accounts for about 25 percent of all homeowners insurance claims every year, while non-weather related water damage accounts for 19 percent of claims and weather-related water damage accounts for 11 percent of them. It’s clear that wind damage & water damage could potentially affect your home in the future at some point and cause you problems. Heavy winds can be particularly problematic during hurricane season and the summer months when thunderstorms occur. A severe storm can cause significant damage to your home in just a matter of minutes. High winds can strip shingles from a roof and blow debris into siding and windows. Stronger winds can lead to structural collapse in particularly bad storms. Any type of damage like this can cost tens of thousands, or more to repair. 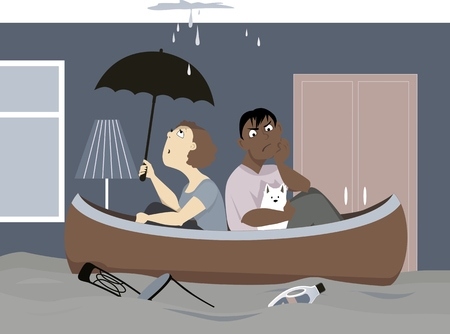 Water damage can be just as problematic for homeowners. Rain, snow and melting ice can cause damage to roofing, siding and other exterior parts of the home. Snow and melting ice can also leak into the lower levels of your home and create significant damage. But you also need to be mindful of the water threats that exist inside of your home. A burst plumbing pipe or a leaky appliance can cause just as much damage as a storm. Water damage can also cost thousands of dollars in repair costs to your home or property. If you ever encounter a problem with your home as a result of wind or water, or if you sustain damage as a result of some other storm threat like hail, tornadoes, or hurricanes, For the Public Adjusters can work with you to get your homeowners insurance company to fulfill their obligations. We have experience settling claims with homeowners insurance companies tied to wind damage & water damage, and we know how to get you the money you deserve. As a homeowner who is already dealing with one of these disasters, you have enough on your plate. So, why add dealing with your insurance company to the mix? Call us at 919-400-6440 today to find out how we can assist you with your homeowners or businessowners insurance claim.